You might have noticed a lot of news lately about robot designs based on insects. Insects are great models for robots because bugs have an extremely stable and efficient model of locomotion: the tripod gait. At any time, roaches have 3 feet on the ground–even when they’re running. This tripod structure makes insects extra-resistant to tripping or tipping over. Biomimetics is the fancy name for engineering systems that copy principles found in nature. Basing robots that need to scamper over rough terrain on an insect model that’s successfully lasted millions of years makes a lot of sense. But just how, exactly, do insects keep all those legs going in the right direction? How can they respond so quickly to an approaching rolled-up newspaper? How do insects manage this advanced scuttling with such a tiny brain? And how can insects keep running even after their head is removed? In order to build a biomimetic robot, one has to first understand the mechanics at work in insects. The engineering explanation for insect locomotion is hidden in equations about viscoelastic spring mass oscillation and tiny insect-mounted cannons. So. Um, WHY did they put jetpacks on roaches? Aside from it just being a totally freakin’ COOL thing to do? Remember I mentioned how stable the tripod gait is? The researchers suspected that the roach wasn’t using just its brain to keep itself balanced and running. They created a mathematical model of a roach with legs that were springs. Just the mechanical properties of springy legs were able to explain how a roach kept on track and at full speed, despite obstacles. They called these “preflexive” mechanisms, to indicate that the exoskeleton and muscles stabilize roaches without involvement of the nervous system. They had an explanation on paper, with a lot of big words and calculations of lateral velocity. The next step was to test their lovely model by poking a roach while it was running. That…was about as difficult to do as you might imagine, based on your experience chasing roaches around your kitchen. 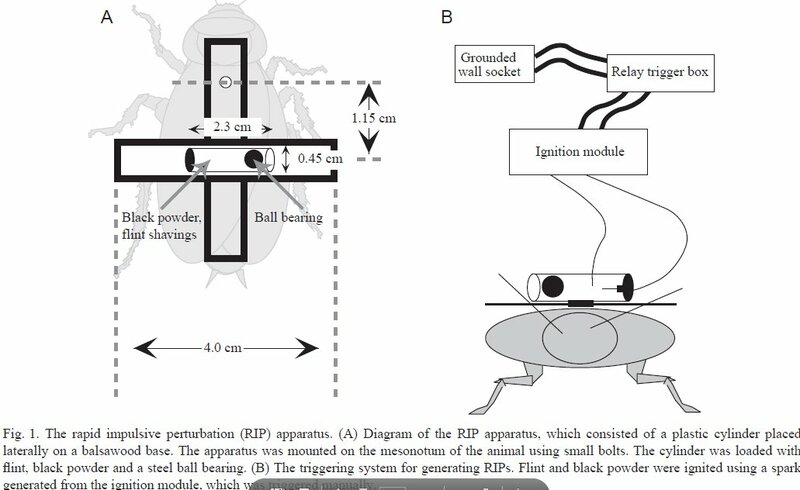 They calculated the lateral force generated by the RIP explosion was equal to 85% of the insect’s forward motion. If you were jogging along, and I ran into you with a force that was 85% of your forward momentum, I don’t think either of us would be standing up. (Ok, yes, there’s mass involved in this too, but just work with me here.) The roaches hardly even break stride. In fact, it took just 13 miliseconds for a roach to begin to respond to the explosion and get back on track. The roaches completely recovered from that RIP explosion within 31 miliseconds. Insects are indeed pretty damn amazing animals, and a great model for robotics. 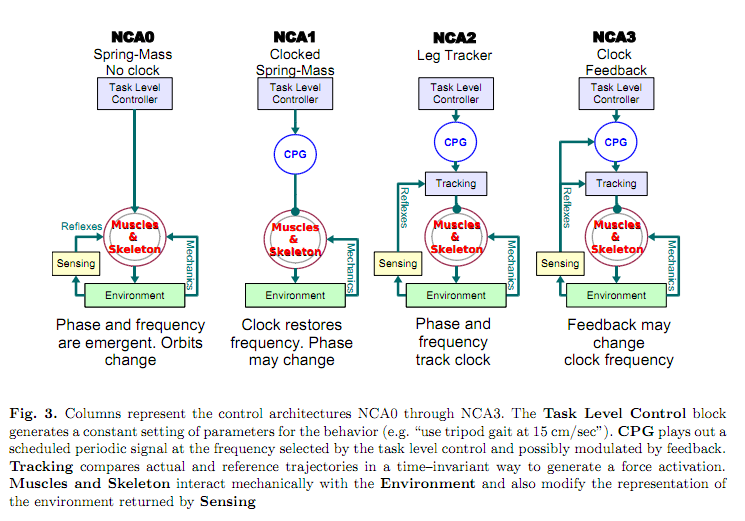 The authors have continued their work on the hexapod gait, and have proposed several models of ways in which legs might be built–in both roaches and robots–to respond quickly to problems. The jet pack roach story ws really interesting. I’m really happy I read it. I for one welcome our future insect overlords. Behold the noble cockroach. Let him show us the way. Yes, and you didn’t even mention that aerospace engineers are trying to mimic insect flight for ultra-tiny unmanned aerial vehicles! That is the weirdest video involving an insect I’ve ever seen. Now that the roaches have a working model, what’s stopping them from mass producing them and using them to augment their speed? Mind you, their midnight scamperings would be truly awesome to behold.